"Meditation is ridiculous! I will do as I please!" Spiritual Kung Fu is, like many of Jackie Chan's older films, a bit odd and rough, but still has a certain importance in the realm of Hong Kong cinema. It was directed by Lo Wei (probably best known for his work with Bruce Lee), allowed Chan a lot of input on the fighting and physical comedy, and also featured an early (though brief) pairing of Chan with his Peking Opera cohort, Yuen Biao, who would later go on to make some devastatingly good movies with Chan. A popular genre in Chinese filmmaking is the ghost comedy, and Spiritual Kung Fu is basically that, despite a few action sequences. It showcases more of the "Buster Keaton-ish" side of Jackie Chan than the action hero side. In the story, he plays Yi, a student at a Shaolin Temple. However, unlike a decent student, Yi seems to care less whether or not he makes himself into a good monk or fighter or anything. Continually getting into mischief and trouble with his friend (one of whom is played by Hong Kong regular Dean Shek), Yi shows little promise as anything but a troublemaker. One day, his temple is shaken up when a mysterious fighter breaks in and steals one of their ancient manuals, called "Five Fist Kung Fu." The art in the manual is deadly, and now some unknown foe (actually another fighter bitter at having lost so many tournaments to the Shaolin) has it. It can only be countered with a sacred fighting technique, but that manual has been lost for decades. After this disaster strikes, the Shaolin library is strangely taken over by a group of restless ghosts who make trouble. When Yi encounters the ghosts he successfully defeats them and makes them obey his commands. In the process of battling these ghosts (which includes urinating on them, oddly enough), he discovers the lost counter-manual to the "Five Fist Kung Fu." The ghosts, who represent the spirits of the Snake, Dragon, Tiger, Jaguar, and Crane, help Yi train his kung fu until he is powerful enough to face the new master of the Five Fists. As a primarily comedy-based film, most of Spiritual Kung Fu involves Yi's confrontations and training with the ghosts, who are represented as traditional Chinese demons with white costumes, flaming red hair, and weird tu-tus. Ultimately, the problem with Hong Kong films that rely on comedy is that it's an acquired taste because of the high level of slapstick and general sillyness. Spiritual Kung Fu, to be honest, gets a little old after awhile; its goofy antics become tiresome. In its day, this might have been an excellent ghost/kung-fu collaboration, but so many films have topped it since (especially Mr. Vampire and Samo Hung's Spooky, Spooky, Spooky) that the effect is a bit muted. Chan has fun with the role, and some of the characters are pretty cool, but overall, this is a fairly mediocre entry in Chan's 1970s era work. Image Transfer Review: Visually, this disc fares quite poorly, thanks largely to an incorrect aspect ratio presentation. The movie is obviously widescreen, but is presented solely in full frame, which results in a total loss of composition. There's lots of action and dialogue that is completely obscured from vision, resulting in confusion as to what's happening in many scenes. In addition to this, the source video is amazingly poor quality, especially given past Columbia transfers of older Chan flicks like this. It is clearly analog, with loads of color blurring, scanlines, and even tracking errors. This is an amazingly bad transfer, simply put, and really makes this disc hard to recommend for purchase, even to die-hard Jackie Chan fans. Audio Transfer Review: Both the English and Cantonese dubs are acceptable, but low in quality. There's some slight hum accompanied with pops and clicks. It should be noted that, in a few sections of the Cantonese dub, the film shifts to English as, presumably, the original audio was lost. Extras Review: There are no additional features, only some trailers. The presentation is average for Columbia's older martial arts films, with reworked cover art. 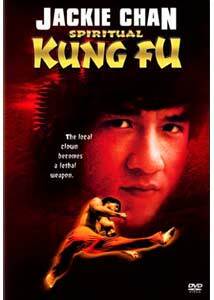 Spiritual Kung Fu is interesting, but easily surpassed by lots of Jackie Chan's own work. It makes a change of pace from many of his older martial films, but the comedy and martial arts mixture isn't done very well.